Oh my goodness, you guys. 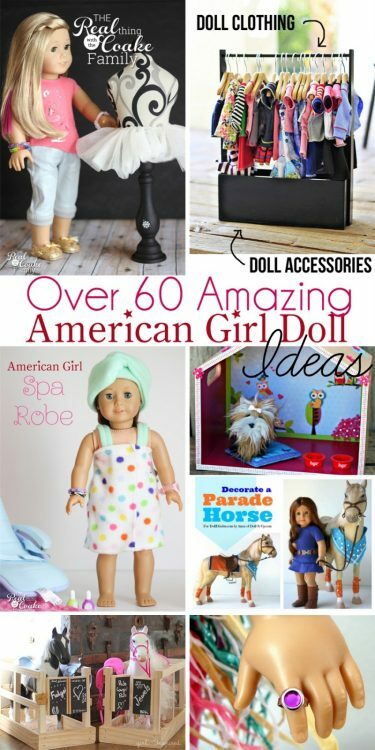 I have got the cutest and easiest craft for you today. I love Easter crafts and decorating my house for each season and holiday, but sometimes life is just busy and I don't have a lot of time or money to make things cute. A quick and cute 5-minute craft is just the thing! I don't know about you, and maybe this is just my craft disorder, but I was walking through AC Moore and I saw these adorable glitter Easter eggs. I knew I had to figure out a craft with them because they had to come home with me. Anyone else just have to make something with something they see? I bought two packs of the glitter eggs with my 40% off coupon and educators discount (a great perk of homeschooling!!). Then they sat for a while. I still had no idea what I was going to do with them. I refuse to buy things and not use them…I'm too cheap for that. So, the other day, I came up with a super simple and totally adorable idea. 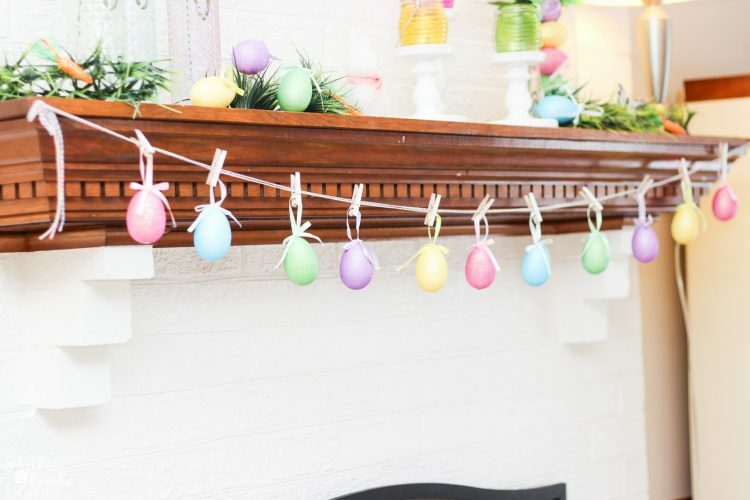 I made a glitter egg garland for my Easter/spring mantel. I'll show you how to make your own as well. As you can see, I came up with a glitter egg garland. It is just so cute. I love all the colors and the glitter. It looks spectacular against my new white fireplace. Start by getting your baker's twine to the length needed for your mantel. I have little nails in each end of my mantel. I tied the baker's twine to the nails. 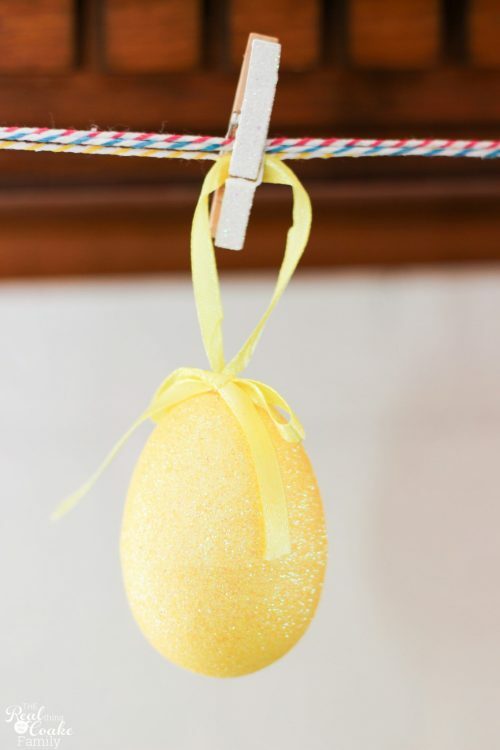 Make sure to make your twine hang shorter than you want it, as the weight of the eggs will bring the twine down some. I used three spring colors of twine to add a little more interest and weight to my garland. Plan out the spacing you want and the pattern you want for your glitter eggs. 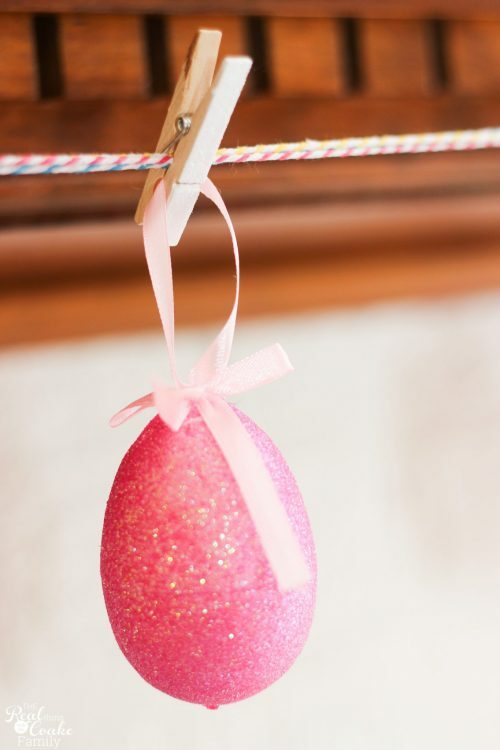 Use the mini glitter clothespins to attach the eggs to the twine. The clothespins are another 10 minute craft, so if you don't have some they are quick to make. 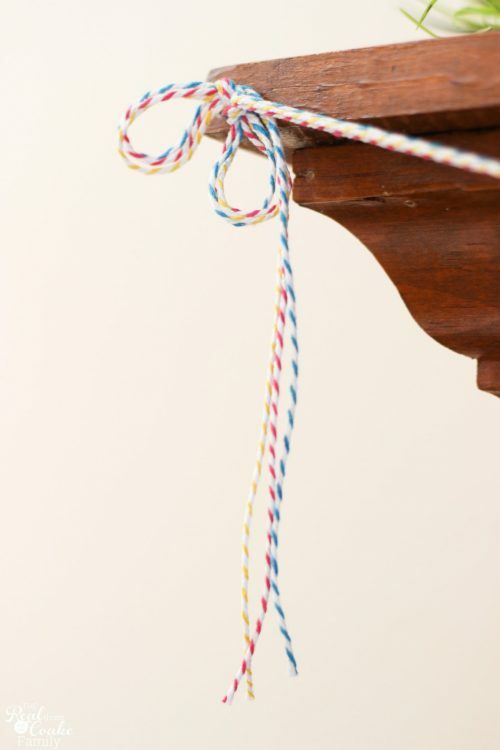 You could even make yours in spring colors if you want to add more color to your garland. 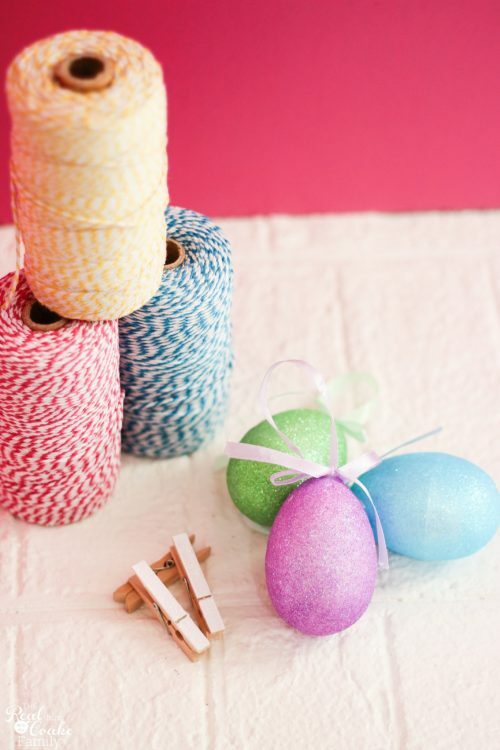 Literally 5 minutes from when you started, you will have this adorable and colorful egg garland. Perfect for your spring/Easter mantel. Speaking of mantels, I've got my spring/Easter mantel that I just love! You can see it in that link. I'm not sure if it is the new white fireplace or all the colors or a combo of both, but I love how fun and cheery the mantel looks. 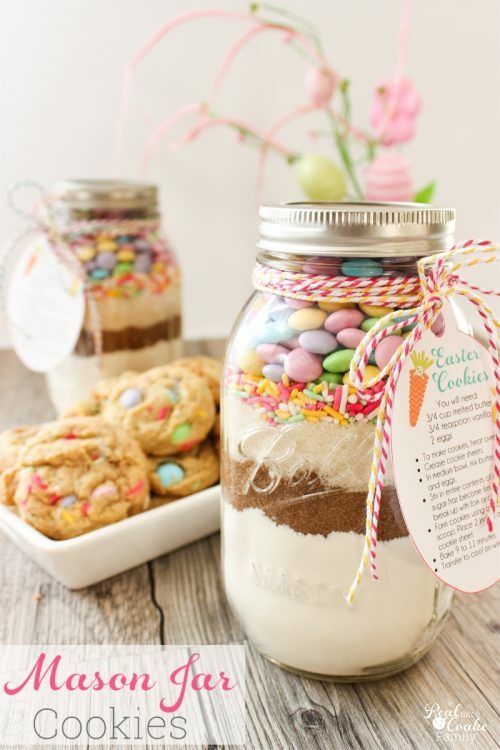 Have you got any 5 minute Easter crafts you can share? Do tell. I'd love to hear more ideas because sometimes that is all the time I've got. Wonderfully creative! I love the use of 3 different colors of bakers twine together! So clever! Found you on Thrifty Thursday. Cant wait to browse your site more. 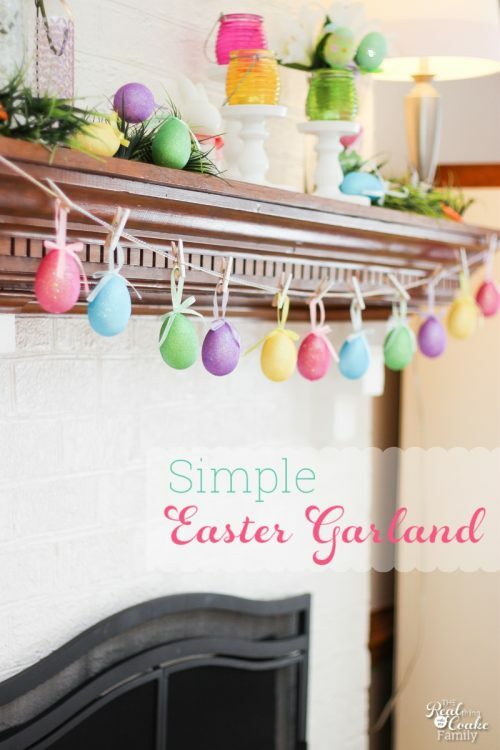 I love the simple egg garland I may have to mix it with the Word garland I created last year. I love the touch of grass on the mantle, what exactly did you use and where did you find it? Thanks! I think I got that at Michael’s last year in their spring stuff. It is a small square of plastic grass. Hope that helps. Love this garland. So cute, I have some eggs similar to those, just might have to copy your idea. Thanks! I hope yours works out super cute as well. Love how easy and quick this is to make.